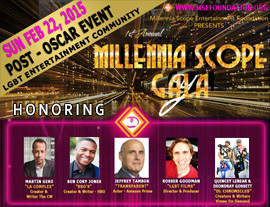 Rosser Goodman an American Film Director, Writer and Producer will be honored on Feb 22nd at the Premiere Post Oscars Party. She directed “Love or Whatever” (2012) that was a TLA Release. Get your tickets today on eventbrite and save as well. Don’t wait until the last day because this will be a sold-out event. Support Support the LGBT Community. Please check her out on http://m.imdb.com/name/nm0329223.